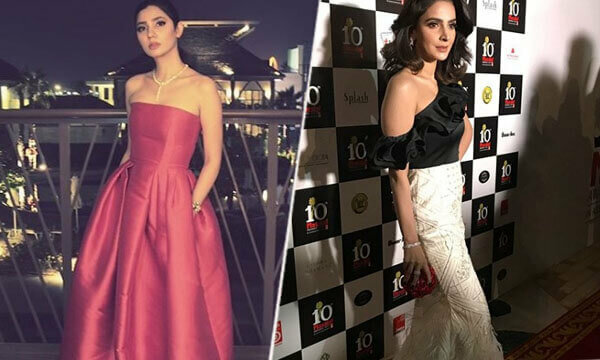 The rivalry between Saba Qamar and Mahira Khan has just gotten intense in the light of the recent events that happened this month. It all started when a few weeks back, Saba acknowledged a fan that compared her with Mahira and bashed the latter for bagging awards for nothing. The Cheekh starlet’s response to the comment triggered a massive uproar from fans of Mahira! Mahira Khan is a celebrity. Saba Qamar is an actress. Mahira can't beat Saba in acting skills but she has personality which Saba lacks. While Mahira often remains silent amidst controversies, this time she took to Instagram and posted a rather cryptic response to all the hate! Without naming and shaming anyone, MK posted a savage quote to silence all the bitter social media trolls! Of course, Twitter was quick in its guessing game and connected it with Saba Qamar! Saba deserved this reaction from Mahira. MK has taken enough of her nonsense. This is not the first time Saba and Mahira became a part of cold war on social media! 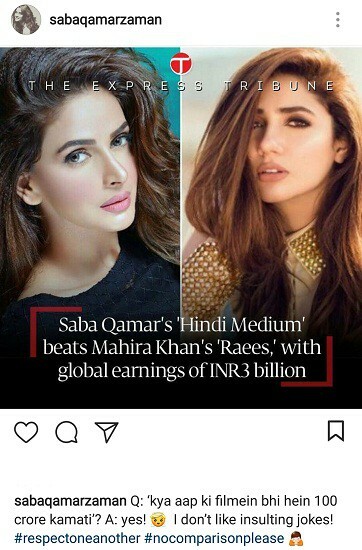 Last year, Saba Qamar’s Hindi Medium had surpassed the business of Raees worldwide. Consequently, the Besharam beauty took to Instagram and took a jibe at the Humsafar Haseena. However, Saba later deleted her post after her sarcastic comment created an uproar! Which celebrity are you teaming up with in this battle? Let us know in the comments below.